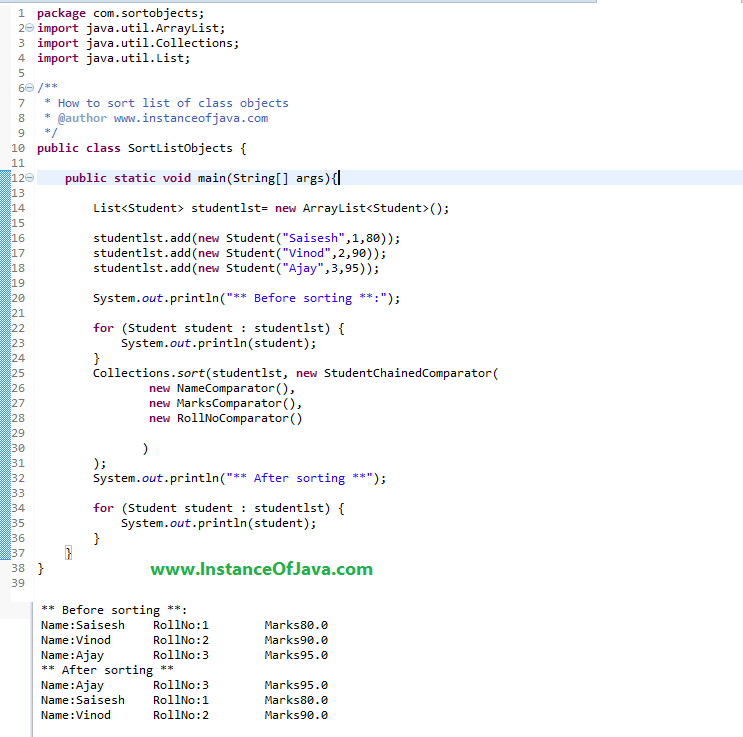 In order to compare objects we have comparable and comparator in java. We need to use different comparators for sorting objects by different fields. We can sort list of class objects by using cmparator. By this we can compare two objects field by field. actually many. Lets see an example program to sort list of student objects by name rollno and marks using comparator. Here comparator means we need to develop sorting logic in separate class which implements comparator interface and overrides compare() method. Define a class as student add variables. Define a constructor to assign values to variables. Define a toString() method to print each variable value inside object values when we print object. This class sort list of student class objects by name. This class sort list of student class objects by Rollno. Create arraylist object and add Student objects with different values into list. Using Collections.Sort(List,FiledComparator) pass corresponding comparator class in order to sort multiple fields of a class. Like this we can compare list of objects by Rollno, and marks aslo. Please practice this example by sorting rollno and marks and check output. if you have any doubts then leave a comment. We can use chained comparator to sort list of class objects by multiple fields by passing multiple comparators.